Settings or services required to complete this request are not currently available. I received the error “Settings or services required to complete this request are not currently available. Try this operation again later. If the problem persists, contact your administrator.” when trying to configure the App URL’s after a greenfield installation of SharePoint 2019 but this can also occur on SharePoint 2013/2016. 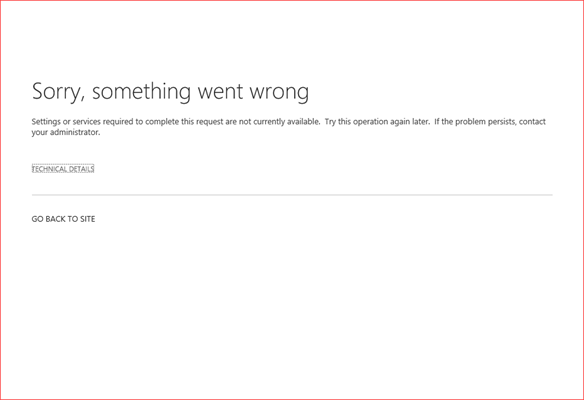 There are a few possible solutions for this error where a reboot of the SharePoint servers is the easiest and quickest. Verify the below SharePoint services and restart these if started or start these if the above doesn’t resolve the issue. 5. Go back to Apps and verify if you don’t receive the error again.